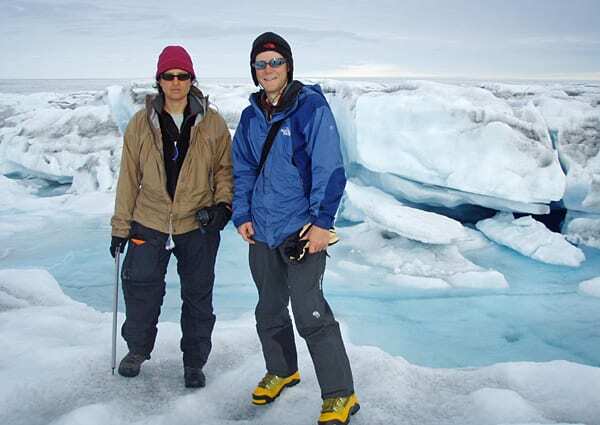 In late July 2006, a 2.2-square-mile lake atop the Greenland Ice Sheet sprung a leak. 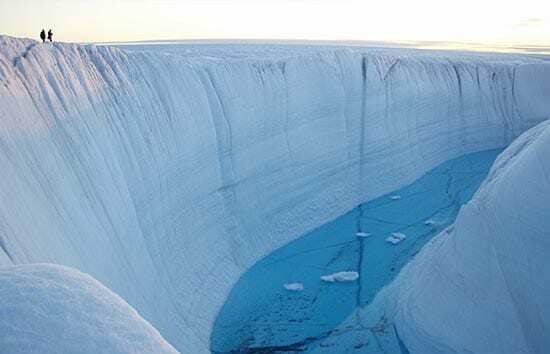 Like a draining bathtub, the entire lake emptied from the bottom, sending water through a crack that reached the base of the ice sheet 3,215 feet below. Most of the 11.6 billion gallons of water in the lake drained out in 90 minutes—at times flowing out faster than the water going over Niagara Falls. 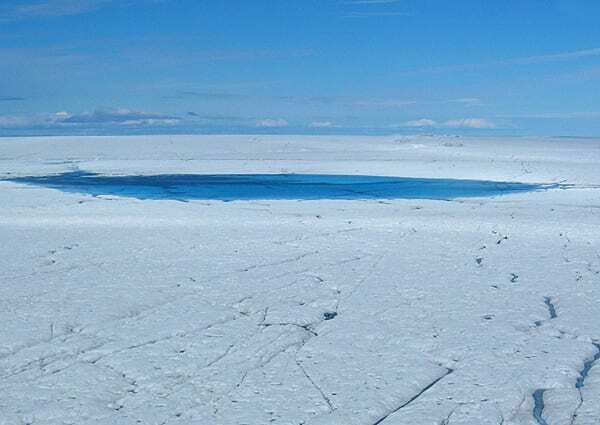 Researchers from Woods Hole Oceanographic Institution (WHOI) and the University of Washington (UW) documented for the first time the sudden and complete drainage of this so-called supraglacial lake—one of thousands that form each spring and summer on top of the Greenland Ice Sheet as sunlight returns and melts snow and ice into water that pools into lakes. 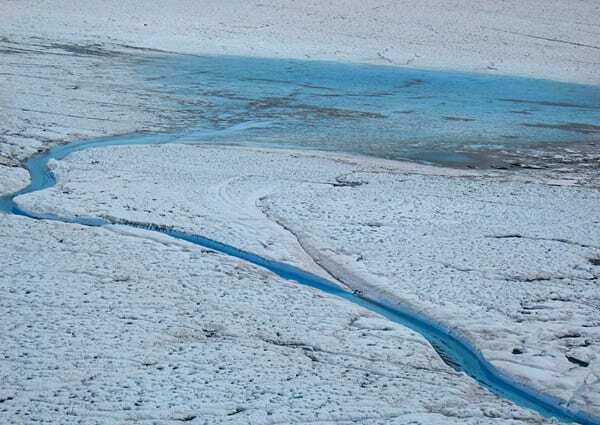 The observation uncovers a long speculated, but never detected plumbing system for ice sheets: Supraglacial lakes can build up enough pressure to crack their bottoms, creating conduits that can penetrate thick ice sheets. The cracks can send torrents of water all the way to the base of the ice sheets, where the water greases the skids between ice and ground. That speeds up the flow of the glaciers’ otherwise steady march toward the ocean, releasing more icebergs that melt into the ocean. The finding adds a new wrinkle to climate change scenarios. 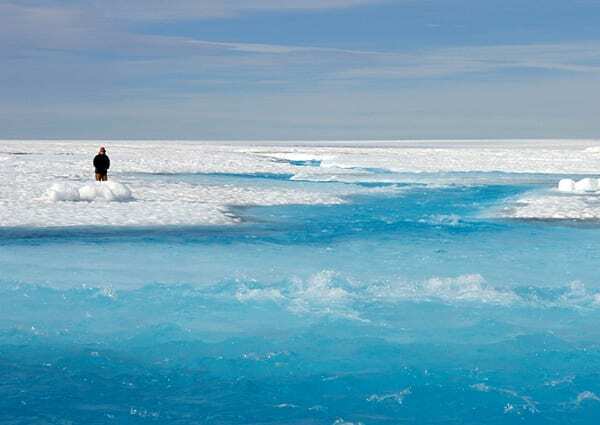 Earth’s warming climate, especially near the poles, could extend the melting season, create more supraglacial lakes across the ice sheet, and cause even more widespread acceleration of the ice sheet each summer. This could increase the rate of sea level rise in the future. 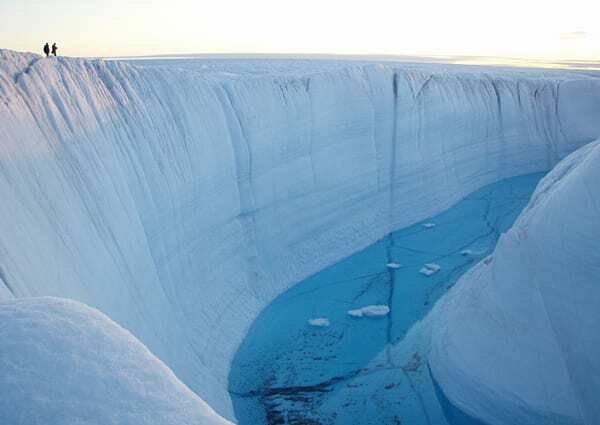 (If Greenland’s 2-mile-thick ice sheet melts completely, it would ultimately raise global sea level by 23 feet, drowning coastal regions). 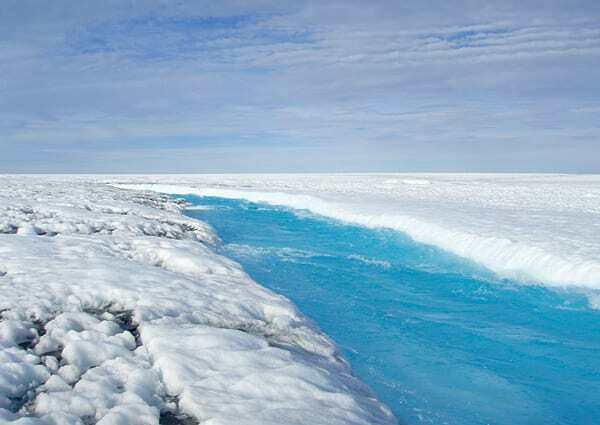 Melting of the ice sheet would also add larger amounts of fresh water to the ocean, which might affect ocean circulation patterns that, in turn, could alter rainfall patterns, fisheries, and climate. Das and Joughin reported their finding May 9, 2008, in the journal Science. The research team also included WHOI scientists Mark Behn, Maya Bhatia, and Dan Lizarralde of WHOI, Ian Howat of UW, and Matt King of Newcastle University. Das and colleagues used seismic instruments, water-level monitors, and Global Positioning System sensors to monitor the evolution of two supraglacial lakes and the motion of the surrounding ice sheet. They also used helicopter and airplane surveys and satellite imagery to monitor the lakes and to track the progress of glaciers moving toward the coast. The research team returned July 8 for their third summer of field work—an expedition chronicled on polardiscovery.whoi.edu. The research was funded by the National Science Foundation, the National Aeronautics and Space Administration, the WHOI Clark Arctic Research Initiative, and the WHOI Ocean and Climate Change Institute. 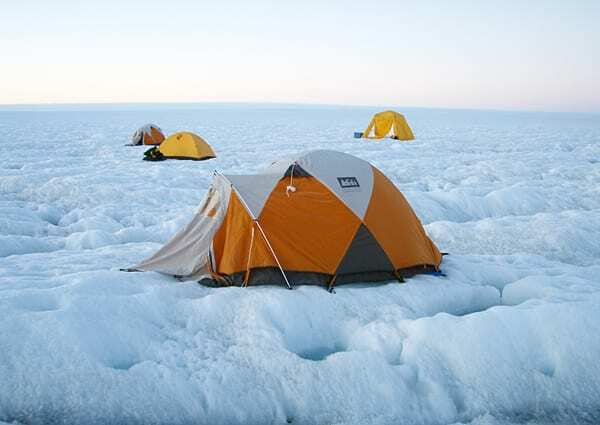 Researchers from Woods Hole Oceanographic Institution and the University of Washington established camps atop the Greenland Ice Sheet in 2006 and 2007 to monitor lakes that form atop glaciers when ice melts during the summer. They returned for a third summer in the field in July, 2008. 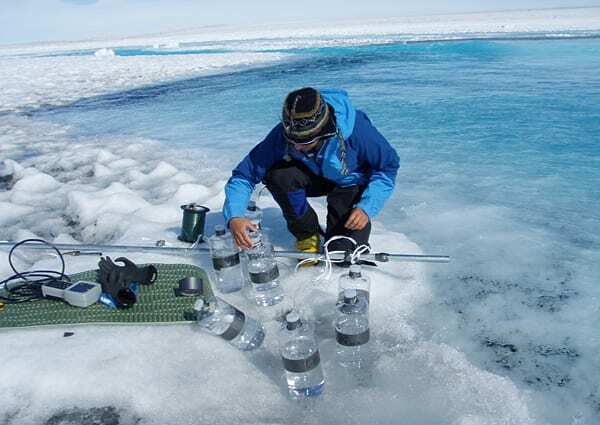 The research team (including Mark Behn, standing here near a meltwater stream) set up a variety of instruments on the ice to learn about supraglacial lakes. These included GPS stations to track the movement of the ice; seismometers to record vibrations from "icequakes" that occur when cracks form beneath supraglacial lakes and drains the lakes: weather stations; and pressure loggers to measure changes in lakes levels over the year.